A woman has been arrested in Newtownabbey today as part of an ongoing PSNI investigation into organised criminal activity. Detailing the arrest, Detective Inspector Heather Whoriskey, from PSNI’s Criminal Investigation Branch said: “Officers from the Paramilitary Crime Taskforce have today arrested a 37-year-old woman in the Newtownabbey area on suspicion of misconduct in public office. 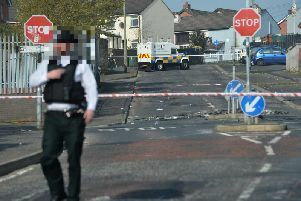 “She has been taken to Antrim Police Station where she is currently being questioned.